There are many versions of tacos, many using meats other than beef, and some meatless or even dessert versions. This recipe, however, is your basic taco recipe, and you can vary it to suit your taste. Add the onion, garlic, salt, pepper, spices, jalapeños and tomato sauce, and stir well. Lower heat, cover and simmer for 10 minutes. 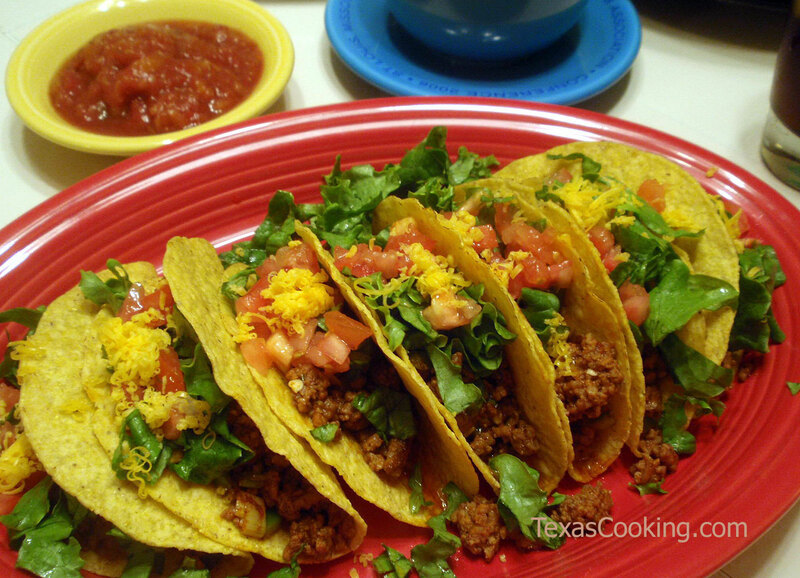 While filling is simmering, heat the taco shells in the preheated oven. Fill hot taco shells with meat mixture, and top with shredded lettuce, chopped tomatoes and grated cheese. Serve with sour cream, if desired. If you'd like to intensify the heat, use more jalapeños or, for more intense heat, use serrano chiles. If using pickled jalapeños instead of fresh, you may want to double the quantity.